Located in the Kelsey Center, the bookstore is usually open during program weekends September through June and during our longer Winter School and summer sessions. The bookstore is closed on non-session days. 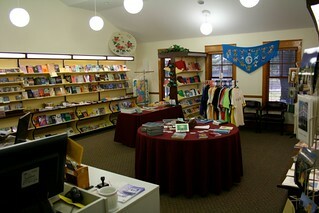 We also offer a small selection of jewelry, T-shirts, and musical CDs. Please contact us at greenacre@usbnc.org or 207-439-7200 for information on specific open hours or for other bookstore questions.